Adjustments let you create positive / negative adjustments to your invoices/debit-memos/ credit memos/deposits/guarantees/chargebacks. 2. Define Approval Limits for the user. Define Approval Limits for the user. Adjustment can be adjusted at Line / Tax / Freight/ Late charges level. We can create manual / automatic adjustments. Select the Activity Name as ‘Adjustment’ and select type as ‘Line/ Tax/Freight/Charges’ and enter the amount within your approval limits and save it. P.S : In case if you select the type as ‘Invoice’, then only option you have is to make the total Transaction balance to zero. Created Adjustment at Freight level: 2000(line) + 100(freight) à 2100. Now we will create a receipt of 2000 USD and adjust 100 USD at Receipt level. In the above screenshot we could also see the earlier adjustment created against the transaction. Enter the required details and save it. As soon as we save it, the Adjustment will be saved and number will be created. 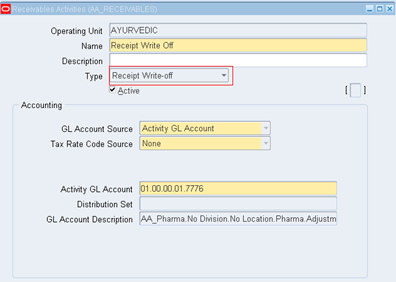 Pass the required parameters and create Adjustments to a bunch of Transactions. Receipt write-offs are used to adjust small amounts which are remaining as under payments / over payments. Receipt Write off can be created manually / automatically. These can be created within user limits. If the user doesn’t have the limits, write-offs cannot be created. 1. 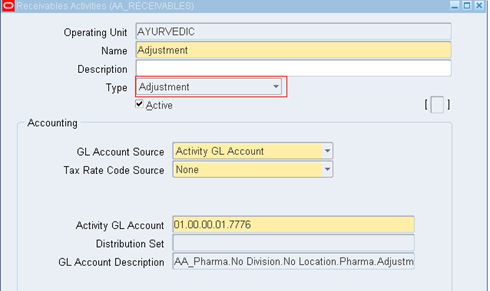 Define a Receivable Activity for ‘Adjustment’. 3. At System Options, define the Receipt Write-Off limit per Receipt. 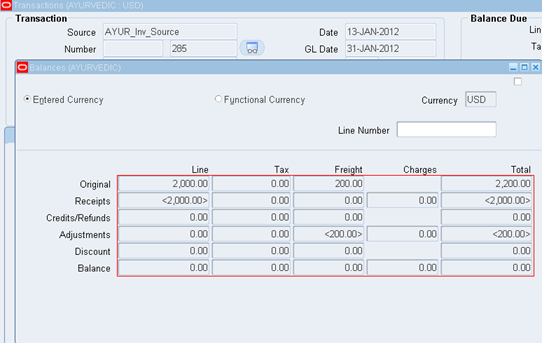 At System Options, define the Receipt Write-Off limit per Receipt. Primarily we defined the user limits and now we defined the write off limit levels for each receipt at Operating Unit level. The total balance of the transaction is 1100 USD. Now create a receipt for 1095 USD. We received 1095 USD from customer and we want to write –off 5 USD. In the above screenshot we can see the ‘Amount Applied’ is 1095 USD and the ‘Balance Due’ is 5 USD. To write-off 5USD, we need to change ‘Amount Applied’ to 1100 USD and add one more line and select ‘Apply to’ as Receipt Write-Off and enter ‘Amount Applied’ as -5 USD and save it. Original Transaction Balance: 1100 USD. Hence the respective Transaction Balance is zero. Automatic write-off Receipts can be created only for Over Payments. As the criteria is ‘Un-Applied’ amount. Pass the required parameters and create write-off receipts for a bunch of receipts.